This small hygiene kit comes from Survival Resources. It is compact, inexpensive, and a great addition to the bug out bag. The overall package isn’t much larger than a deck of cards. Despite that small size, there is actually quite a bit packed into this kit. For basic body cleansing, we have a small bar of soap, hair shampoo, two wet wipes, and a Lightload towel. This last item is pretty nifty. It starts as a very small disk shaped package but expands into a 12″ x 12″ towel. For dental care, we have a toothbrush, toothpaste, and two packages of dental floss. Then, we have a small comb and 5 cotton swabs. All of these items are stored in a 4 mil ziplock bag. Having a small hygiene kit like this is a great idea for each bug out bag and/or get home bag. It is small and light, taking up almost no space. I like the fact that each item is individually wrapped and packaged, too, which keeps everything sanitary until you need it. Now, as with any type of kit, take the time to customize the contents to suit your needs. For me, I’d add more dental floss looped on a plastic sewing bobbin as well as toss in some of those plastic tooth flossers that have a toothpick end on them. Floss can be used in a number of ways, such as expedient fishing line or for making a quick clothing repair. To that end, I might add in a sewing needle or two. Not because that’s a hygiene item but a small kit like this wouldn’t suffer from the addition. Survival Resources also sells refills for each of the items in the hygiene kit. You can find them at the bottom of this page. 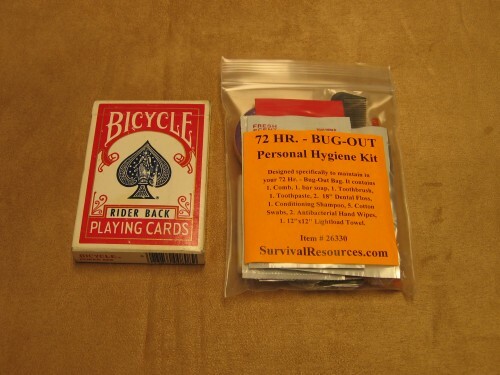 The Bug Out Personal Hygiene Kit retails for a whopping $3.75. Quite a great deal, in my opinion.